As the world's largest marathon, only London ranks alongside New York in terms of running prestige. 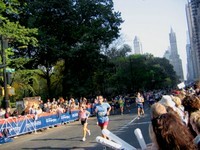 The New York City Marathon hosts more than 35,000 runners from around the world, with a route passing through all five of New York City's five boroughs before finishing in Central Park. Spectators line the way, famous celebrities take part, and there's usually some athletes in fancy dress, all creating a festive atmosphere. As so many people are keen to run, the general participants are usually selected in a lucky draw. Check the official website for details.